Taiwan’s offshore wind farm sector is developing rapidly – as are opportunities to build dedicated vessels to handle wind park installation and maintenance work.The country’s government has set itself a target of 5.5GW of offshore renewable energy by the end of 2025, and at least 10 sites have been identified for development off Taiwan’s west coast. In response, domestic shipbuilder CSBC Corporation has signed an MoU with the Taiwan International Port Corporation and shipowners Yang Ming and Taiwan Navigation, to support further growth of this sector. A spokesperson for CSBC tells Ship & Boat International: “The government is promoting [us] as the transportation and installation [T&I] leader for maritime engineering in the development of Taiwan’s offshore wind farm infrastructure.” Although CSBC will not exclusively provide all the necessary support vessels for its national sector, it will actively focus on a good bulk of the powerful vessels required to get the wind parks up and running. “In addition, the Taiwan Government has applied a ‘local content’ requirement for the production of vessels for this sector, which means that more newbuilding opportunities will be provided to local companies,” the group says. CSBC currently oversees two build/repair facilities in Taiwan: its Kaohsiung Shipyard, which produces approximately 12 vessels (totalling 1.1 million dwt) yearly; and its Keelung Shipyard, which produces an average of six ships (totalling 300,000dwt) per annum. The company employs approximately 3,000 workers and boasts a 275m dock at Kaohsiung and 210m and 270m docks at Keelung. 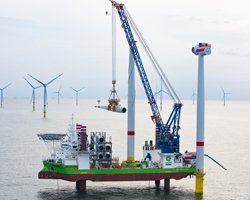 Reflecting on how to best support the push towards 5.5GW of offshore renewable power, CSBC adds: “The main vessels would include turbine installation vessels, heavy-lift vessels and floating cranes. Other supporting vessels – such as tugs, barges, dredging vessels, rock-dumping vessels, investigation vessels, drilling vessels, crew transfer vessels, anchor-handling tug supply [AHTS] vessels, PSVs and cable-layers – will also be needed.” Regarding how many vessels will be needed in total, CSBC responds: “It depends on the wind farm developers, the project timeline and their subcontracting – as well as bidding strategy. If the work flow of two different wind farms is coordinated and connected smoothly, some of the vessels in the spread may be combined to execute successive projects. In addition to building many of the required vessels, CSBC will also play a role in servicing the domestic offshore turbine farms. In December 2017, the company signed an agreement with GeoSea, part of the DEME Group, to form the CSBC-DEME Wind Engineering Company. Situated in the Taiwanese capital of Taipei, this venture will compete for contracts to install foundations and turbines at the country’s proposed sites. Described by CSBC as comprising “the only local joint venture EPCI company”, this relatively new company will “do its best to deploy the most efficient equipment to Taiwan and cooperate with local marine companies to meet the developers’ target capacity and timelines”, the builder says. Currently, CSBC is working on a 140m x 41m barge, which will feature a deadweight of approximately 23,000tonnes, a pumping capacity of 6,000m³ per hour and the ability to carry an entire offshore substation and accompanying 3,500tonne foundation, 3,400tonne topside and four 300tonne pin piles in a single run. Alternatively, CSBC says, the barge will be capable of moving three 30m x 30m jackets of up to 80m in height and 1,200tonnes apiece. Delivery is expected by the end of summer.